Morehead City, NC Bojangles'® Tands, INC. Store #6 - Bojangles'® / Tands, Inc. Heading to the Crystal Coast area? Swing by this Bojangles’® location in Morehead City, NC to pick up a Big Bo Box—perfect for tailgating or picnicking on the beach! Or you can enjoy all your Bojangles’® menu favorites at our Morehead City location, including our famous made-from-scratch biscuits, Cajun fried chicken and fixin’s. 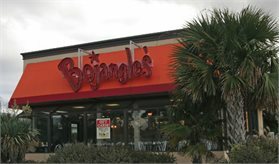 For breakfast, lunch or dinner, Bojangles’® is your Morehead City, NC spot for a tasty, satisfying meal at an affordable price.